To make reading more fun, interesting and interactive we have also added Big Books in our list. These book could be used by teachers in classrooms or by parents while teaching at home to narrate stories to the children and show them the illustrations while reading. Black, brown and white kitten are on a spree to catch a rat. 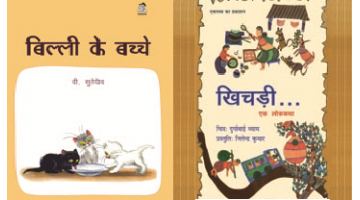 Read to find out where the spree takes ..
Khichdi… Ek Lok Katha is the first book in Hindi that is available in the big book format. ..